Discussion in 'Creations' started by Noxite, Jul 6, 2017. A new map for the Minecraft Marketplace on Pocket Edition and Windows 10 Edition! Grab your swim trunks and head to the beach! 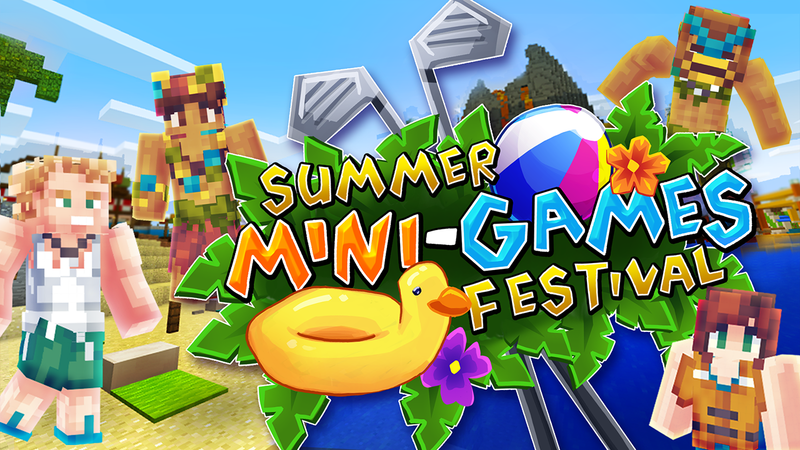 The summer mini games festival is open for business! So take a daytrip with your friends and test your skills at Mini-Golf, Blocksketball, and the shooting range! 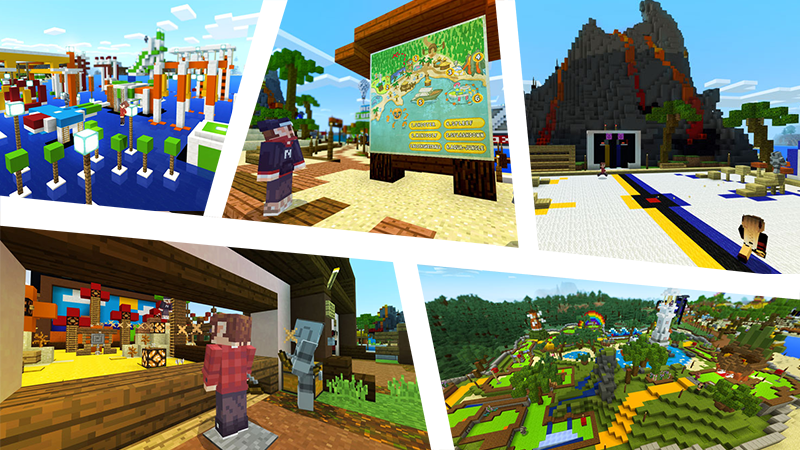 Play Splashdown in a luxury boat, Spleef in a volcano, and monkey around in the Aqua Jungle! A survival / Mini-games hybrid map; choose to roam around the summer festival and play all the different mini games on offer, or head out and create your own world! Mostly built to play with your friends, but includes a few single-player friendly mini games too! Includes shops where you can trade in your earned emeralds from the mini games to gain rare items to enhance your survival experience! Explore the park to find hidden secrets! 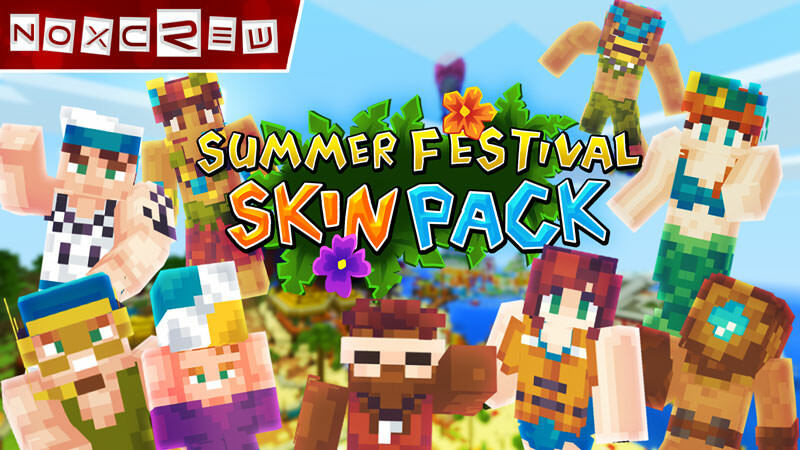 Also now available: Summer Festival Skin Pack! A new skin pack for the Minecraft Marketplace on Pocket Edition and Windows 10 Edition! Forgot your swimsuit heading to the Summer Mini Games Festival? Try one of ours! Swim the seas as a mermaid or roam the surf in our stylish beach wear. Show off your summer colours with this seasonal skin pack! Definitely gotta try this! I enjoyed Destructobot 5000 like you wouldn't believe and this looks like an amazing multi-player experience. Definitely doing a video on THIS! Awesome! Make sure to link us to the video when it's up! I bought the map and I seem to have an issue. The texture pack won't load when I go to play it and it says one or more of your texture packs failed to load. No clue why, and on top of that, it's saying that destructobot along with a few other maps are incompatible with my device. What device are you using? There are ram requirements to play the map, and sometimes just restarting your device will clean your device enough to make the maps playable. Oh! You were right! I literally restarted my tablet and it's all working fine now. Thanks! OK! Here is the first video! We ended up filming WAY more than intended (about an hour an a half) so I decided to split it up into 3 episodes, so this is the first. I just wanna say that I enjoyed the map A LOT, and it was so much fun. Since filming I've already played each game over 5 times, and it never gets old! Great job with this map! Noctis and Avondale like this. OK, so the second episode is up and unlisted on my channel, so I'm putting it here a few days early. Episode 3 should be out this time tomorrow. For anyone interested, here is my third part of playing through this map. It was a blast! Amazing job! This map was the reason I installed the W10 edition of Minecraft. I'm loving it. My wife is anxious to play and then move on to Adventurer's Dream. I believe that it is only available for Windows and Windows Compatible editions (such as pocket) that have access to the in-app store. 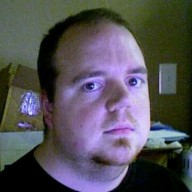 In order to use it on the Mac version you would probably need to individual files to import the world manually. I may be incorrect. Unfortunately, the Marketplace maps can't be played on mac OS. 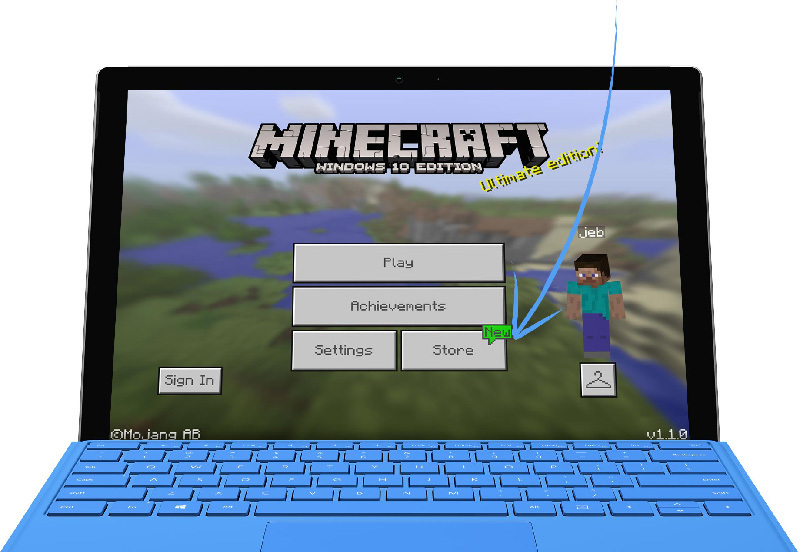 They require W10 or Pocket versions of the game to work. How do I use the camera? I'm on win 10. You have to use the power of "Imaaaaaginaaaation"